Falmouth is in the extreme South-West of England, close to the historic Camborne-Redruth mining area; the ‘birthplace of modern mining’ and a UNESCO World Heritage site. Situated on the south coast of the Cornish peninsular, its remoteness means that journeys are relatively long, but more than compensated for by the beauty of the English countryside and coastal scenery en route. Below are the various options for travel to your hotel. 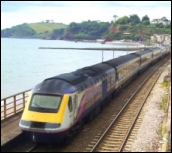 This is our recommended option, as the regular First Great Western service form London to Falmouth is one of the great English rail journeys, passing through the beautiful countryside of Somerset and Devon before crossing the River Tamar at Plymouth, and entering the remote county of Cornwall. For a video view of the most interesting part of the train line, we recommend you watch this YouTube video entitled: "The Dawlish Sea Wall, Nothing is Impossible for an Engineer". Trains run regularly from London Paddington to Truro (where you can change for Falmouth). There is even an overnight 'sleeper' train. From Heathrow Airport, take the Heathrow Express direct to Paddington. This runs every 15 minutes, with an average journey time of 15 minutes. From Gatwick Airport, take the Gatwick Express to Victoria Station, from where it is a short taxi or tube journey to Paddington. An alternative is to take the train from Gatwick to Reading, where you can connect with the Paddington-Truro train, but be aware that seat availability may be limited at this stage of the journey. At Truro there is a regular service to Falmouth. Travel to the terminus, Falmouth Docks station, where a representative from MEI will be waiting to transport you to your hotel (if you require this service please contact us with your expected arrival time at Falmouth Docks). You can plan your route using The AA route planner. 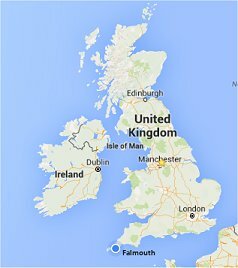 We suggest that the train is the best option for travelling to and from Falmouth. If you wish to tour Cornwall after the conference, we then suggest that you rent a car for travelling within the county. This is the quickest option, with daily flights from London Heathrow to Newquay Airport with Flybe. If you are arriving at Gatwick, you will need to take the bus link to Heathrow or get a taxi. Newquay is a 40 minute drive from Falmouth and taxis are available at the airport. The cheapest way to travel to Falmouth is by coach. National Express coach services provide services from the airport to Falmouth centre. At Falmouth, there are taxis available to take you the short journey to your hotel.